DOC Meeting Argentina, is an international meeting dedicated to the joint production of documentaries with venue in Buenos Aires. Doc Meeting Argentina has the biggest Pitching Forum of Latin America, an increasing market of Documentaries and a series of conferences made by the most prestigious representatives of the industry. This meeting has offered a strong impulse to the creation of a network of work, as well as possibilities of new business, among to the great development that the documentary market is experiencing in the last years. 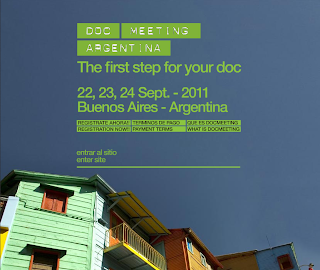 In his edition 2011, DOC Meeting Argentina will take place between the 22nd and 24th of September. This way, producers of documentaries could present their documentary projects in our market.